Hope Presbyterian Church at Lake Nona - What Are You Doing for Jesus' Sake? 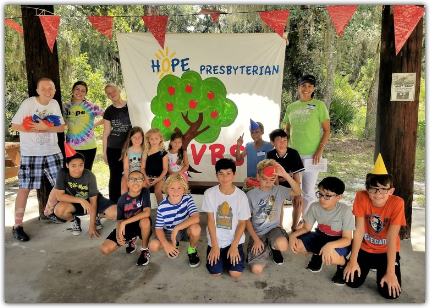 For our fourth annual VBS on 7/27, leaders taught us the theme verse, "Whether you eat or drink or whatever you do, do everything for the glory of God" (1 Corinthians 10.31). It's actually a life verse for me -- and a great lesson for Christ-followers of all ages. The modern era taught us, erroneously, to compartmentalize our spiritual lives -- to think of faith as a Sunday morning exercise. It's my passion to help all of us realize that everything we do -- from worship and study and spiritual practices to playing, laughing, singing, listening, showing kindness, and pursuing our vocation -- is unto God. What a great lesson for the youngest Hopesters to grasp during their student years. It will serve them well throughout life. So what are you doing for Jesus' sake, my friends? In a very real sense, the answer is "Everything we do!"